This diagram is more complex than government official/citizen and master/slave. 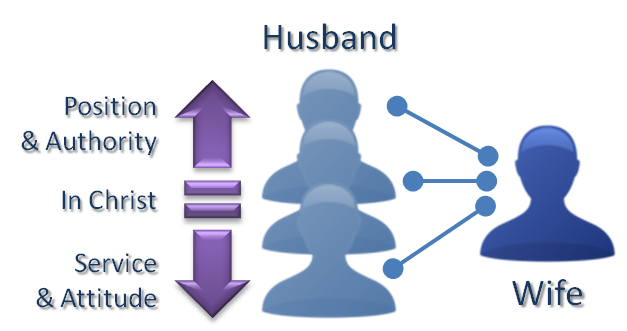 We start to see differences in how a husband is positioned differently relative to his wife if you starting considering the relationship from multiple perspectives. The wife has authority over the husband’s body and has a right to marital relations. This is a right and an authority according to the Bible. In service & attitude, the husband should lower himself to have the mindset of a servant to his wife. Important Note: the Bible does not say “obey” when it talks about a wife’s duty to a husband, it says “submit”, “subject”, “submissive”, “in subjection”. There are differences between submission and obedience which should be understood before assuming that submission equals obedience. Submission does not equal obedience and the Bible is clear about this. In service & attitude, the wife should remain submissive. The Bible also describes a set of responsibilities in the home setting for the wife. In modern times, some of these can be controversial. We will evade this controversy and simply present the verses from the Bible. Ephesians 5:21-24 – being subject to one another out of reverence for Christ–wives to their own husbands as to the Lord, because the husband is the head of the wife, as also Christ is the head of the church (he himself being the Savior of the body). But as the church is subject to Christ, thus also wives should be subject to their husbands in everything. Ephesians 5:25-33 – Husbands, love your wives, just as Christ also loved the church, and gave himself for her; in order that he might sanctify her by cleansing her with the washing of water by the word; in order that he might present to himself the church glorious, not having a spot or wrinkle or any such thing, but that she may be holy and blameless. Thus also husbands ought to love their own wives as their own bodies. The one who loves his own wife loves himself. For no one ever hated his own flesh, but nourishes and cherishes it, just as also Christ does the church, because we are members of his body. “For this reason a man will leave his father and mother and be joined to his wife, and the two will become one flesh.” (This mystery is great, but I am speaking with reference to Christ and the church.) Only you also, each one of you, must thus love his own wife as himself, and the wife must respect her husband. Titus 2:3-5 – Older women likewise are to be reverent in their behavior, not slanderous, not enslaved to much wine, teaching what is good, in order that they may encourage the young women to love their husbands and to love their children, to be self-controlled, pure, busy at home, good, being subject to their own husbands, in order that the word of God may not be slandered. 1 Peter 3:1-2 – In the same way, wives, be subject to your own husbands, so that even if some are disobedient to the word, they may be won over without a word by the conduct of their wives, when they see your respectful, pure conduct. 1 Peter 3:7 – Husbands, in the same way live with your wives knowledgeably (i.e. in an understanding way), as with the weaker female vessel, showing them honor as fellow heirs also of the grace of life, so that your prayers will not be hindered. 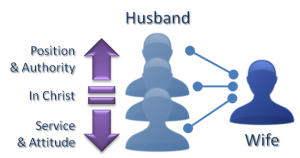 As shown in the diagram above, the relationship between a husband and a wife from the husband’s perspective is more dynamic. It is not simplistic. The more dictatorial attitude of “I’m in authority here in my house” that can easily emerge in the fleshly mind of men. The position of authority for a husband doesn’t have to be lorded over a wife in order for it to be a reality. It’s just a reality. God has set the husbands over wives from a positional and authority perspective. This is according to the edict of God. This does not mean that husbands wield this authority properly. It also doesn’t mean that wives respect this authority. However, it is a fundamental truth according to God’s arrangement. Nothing said or done changes it. It is very important for husbands to separate the idea of “being in authority” from their attitude & approach towards their wives. The behaviors of a husband (who is in authority over his wife) should be very different than what their positional authority may seem to imply. The position of authority comes with key responsibilities, behavioral expectations and acknowledgements about how to relate to wives. Husbands, in the same way live with your wives knowledgeably (i.e. in an understanding way), as with the weaker female vessel, showing them honor as fellow heirs also of the grace of life, so that your prayers will not be hindered. I am a husband. This is a tall order. The fact is…I cannot do it in my own ability and strength. My ability to love my wife is insufficient. There is no attempt to solve this problem in this short space. We’re just looking at the standard set by God. The only clue provided is that it is Christ in you that can love your wife even as Christ loved the church. You can’t do it by yourself. The standard of love set by God is the context within in which the husband’s authority is established. Even though the husband’s authority is a reality established by God, the healthy exercise of this authority is according to the principles of love. If husbands were to fulfill this tall order, then it would become much easier for wives to do their part in the relationship, which is to submit. If you are a husband reading this, do you think your wife would be able to submit and respect you if you loved her according to the standard presented above? For some men, the idea of implementing this kind of approach towards their wives would seem to strip them of their manhood. This perception is understandable, but false. The idea that you would lose any of your manhood as a result of loving your wife as Christ loved the church is deception from the Enemy of God. The primary theme for wives relating to their husbands is submission. It is repeated multiple times as shown in the verses above. To submit, is to consider yourself as being UNDER someone else. It is positional in nature. The husband is in front and positioned to be at the head of the family. The wife is not. This isn’t about appearances, this is about reality. There are some strong women in this world and some passive men that get married. In this scenario, there can be an appearance of the strong woman taking authority. The internals of how a husband and wife relate must be examined before the assumptions based on appearance are taken to be the real status of their relationship. Again, it is a reality that wives are UNDER their husbands from a positional perspective. This position does not mean that wives are less. Wives are to be honored, cherished, respected and considered as equals in Christ. I believe the key point here is that husband’s have been placed in a position of responsibility within the family and therefore they hold the authority. This is practical and it is spiritual. Wives have not been positioned with as much responsibility from God’s point of view. This doesn’t mean they don’t bear some responsibility. It means that when God looks at a family, He looks at it through the husband and will hold the husband more accountable. We should also be clear on another point. Submission does not equal obedience. Read all the verses again about husbands and wives. There is not a single instance where wives are commanded to obey their husbands. The command is always to submit. The differences between submission and obedience are complex. <TBD>This will be covered more thoroughly in another section of this writing<TBD>. There is an implication of the need for obedience within the idea of submitting to a husband, but it is not limitless obedience that is required or expected. Here is one example where submission and obedience part ways. If a husband commands a wife to do something that is sin, a wife does not have to obey. This can still be done with a proper attitude.